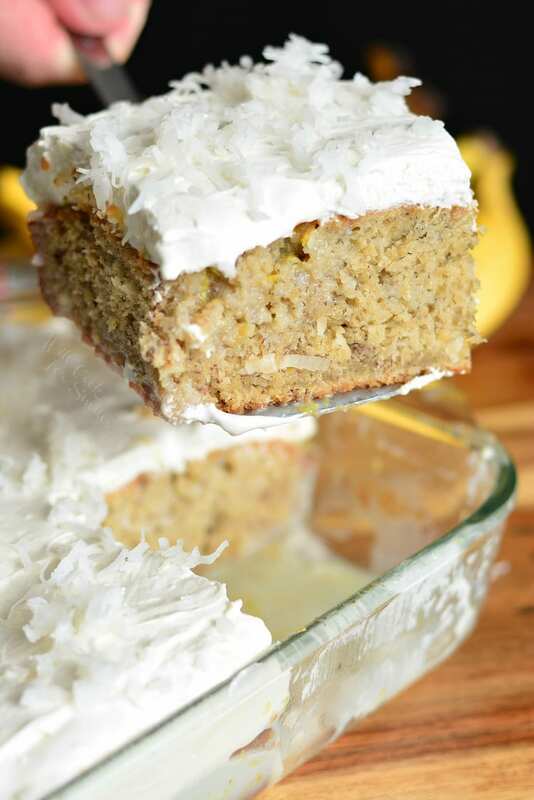 Soft and moist banana cake made with coconut and lemon flavors from top to bottom. 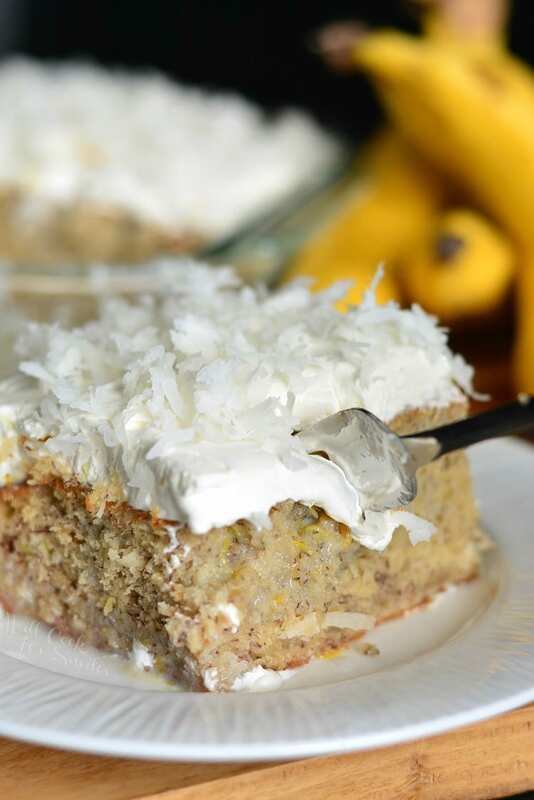 This tasty Lemon Banana Coconut poke cake is topped with creamy coconut syrup and fluffy lemon coconut frosting. I got something special for my backyard the other day. I’ve always wanted to grow my own citrus trees and I finally got one. It is so exciting even though it’s still teeny. So, after spending 30 minutes just sniffing the amazing aroma of citrus tree, I settled in the small key lime tree as my first one. As time goes on, I plan to expand my collection and hope to get one of each tree. It would be amazing to be able to walk out to my back yard and pick a couple of limes or lemon off my own tree. Spring time would be heavenly with blooming citrus tree right outside my window. Until I can get my citrus tree collection bought, planted, and producing fruit, I have to settle for store-bought lemons for my cakes, cookies, pastries and seafood. Nothing wrong with store-bought lemons, I just like the freshness, convenience and scent of home grown. I’ve actually been buying a ton of lemons lately. 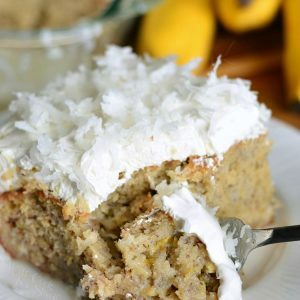 I love using lemon in spring recipes. It’s bring, sunny, and reminds me of the beautiful weather that is to come. 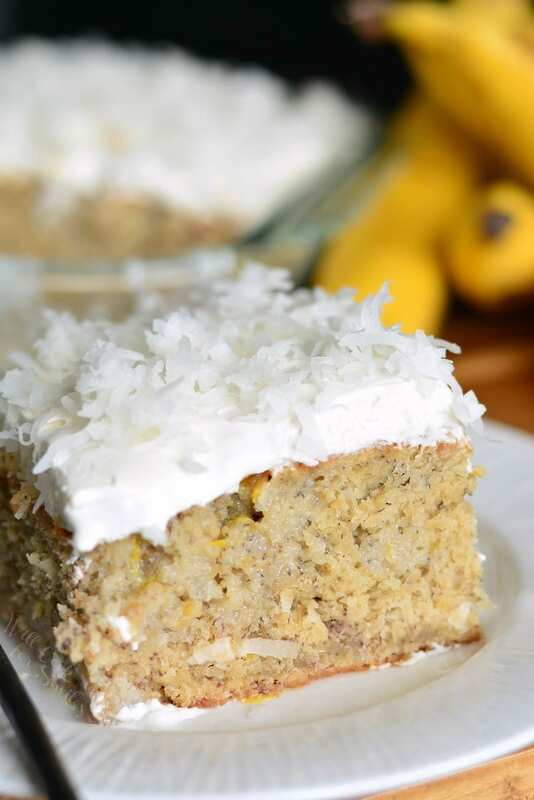 Like this cake, it’s a wonderful spring/tropical banana cake that would be lovely to serve for spring holidays. Preheat the oven to 350 and grease a 9x13 casserole baking pan. Combine flour, both sugars and baking soda in a large mixing bowl. In a separate bowl, whisk together oil, buttermilk, eggs, vanilla extract, and smashed bananas. Whisk until all combined. Pour wet ingredients into the dry ingredients. Mix with a spatula until smoothly combined. Fold in lemon zest and coconut flakes until evenly distributed. Pour cake batter into the prepared baking pan and spread it evenly. Let the cake cool for about 10 minutes. Poke holes all over the cake (use something that is about a pencil thickness). 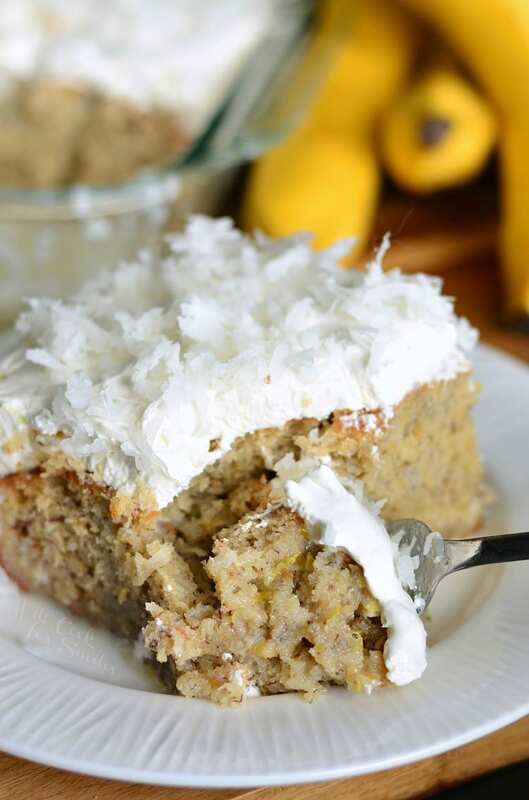 In a mixing bowl, whisk sweetened condensed milk, lemon zest, and cream of coconut. SLOWLY and evenly, pour sweet sauce mixture all over the cake. Let it seep in and cool completely before frosting. I usually pour it slowly and try to hit every hole so the not all the syrup runs off the sides. Beat cream cheese on medium-high speed, until smooth, 1-2 minutes. Scrape sides and bottom of the bowl. Lower the speed to low and pour in cream of coconut. Mix on low until starts to incorporate and then bring up speed to high and beat for 2-3 more minutes. You may need to stop in the middle to scrape sides and bottom of the bowl. Turn down the speed to low and add COOL Whip and lemon zest. Fold until evenly incorporated and smooth. Once the cake is cooled completely, evenly frost the cake all over. 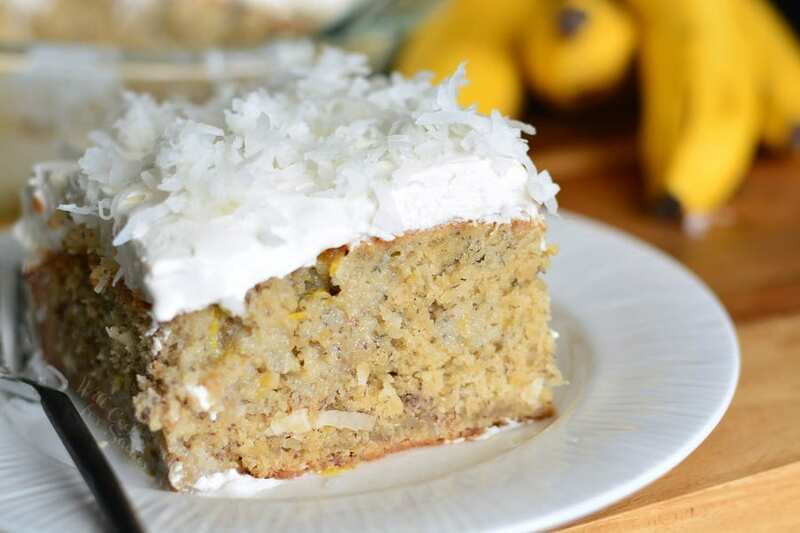 Optional: spread coconut flakes all over the top of the cake. 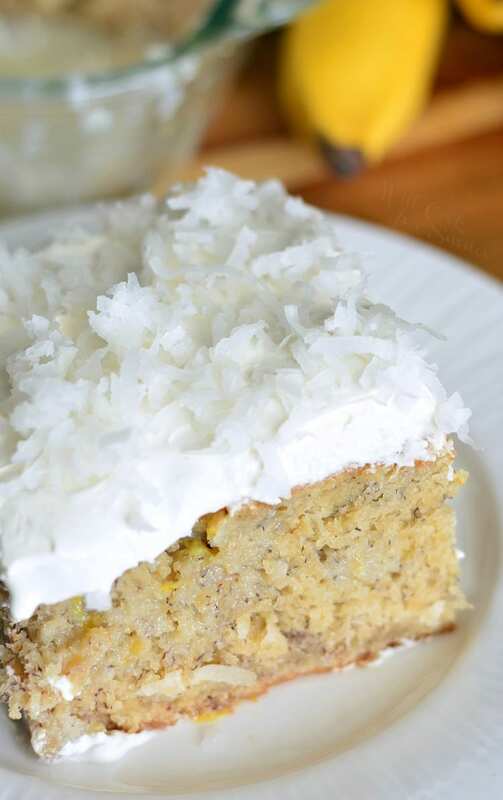 Cake can be served right away at room temperature or cold. Personally, I think it's best after the cake had some time to soak up the syrup. Cover and keep the cake refrigerated when not serving.